In my series of ‘What … can teach you about content marketing’, I’m looking at how businesses in diverse industries are using and benefitting from content marketing. My first blog in the series covered selling tractors and next up it’s swimming pools! Marcus Sheridan was the co-owner and retail store manager of Riverpools, a US-based above-ground fibreglass swimming pool company with two retail stores in Virginia. In 2008, when the US economy crashed, the market changed, and the business stopped generating revenue. Consultants advised the partners to file for bankruptcy, but the partners wanted to keep the business afloat and their 16 employees in work. To save the business, Marcus knew he had to generate more traffic and leads to generate sales. With little money for advertising, he looked to the internet and threw himself into learning and putting into practice the new ‘inbound’ and ‘content marketing’ he was reading about. 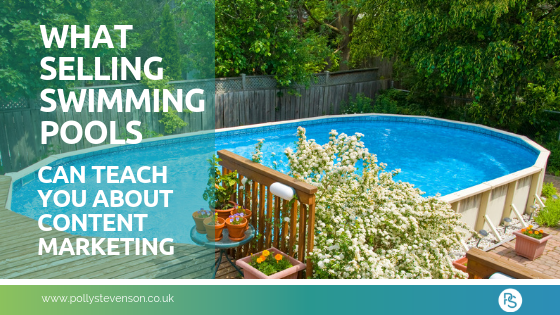 In 2009 Marcus started blogging on the business website, answering his clients’ and prospects’ questions, and addressing their issues, fears, worries, and concerns about swimming pools. The whole business lived by the philosophy: “They Ask. You Answer,” (also the title of a must-read book written by Marcus). Riverpools listened to their customers and prospects. They answered their questions consistently and transparently through writing and video. No other competing business in the swimming pool market was answering these questions. The results were amazing. With over 750,000 visitors a month, Riverpools is now the most visited swimming pool website in the world. The retail business is very successful, and they now manufacture pools and have dealers across the US. Marcus has become a sleeping partner in Riverpools and has grown his own online marketing consultancy business, called The Sales Lion. He continues to place a huge emphasis on content marketing, messaging, and powerful communication. Today, your prospective clients look to self-educate themselves online. They are looking for answers to their questions or concerns. A large part of the sales process (some experts say 60-80%) is over before a prospect even calls or emails you. Clients are coming to your website to find answers, but they will also vet you and begin to feel comfortable about your business and their decision to work with you. If you don’t have a strong presence online and aren’t helping your clients solve their queries, but your competitors do, it will be your competitors who they turn to first. Marcus Sheridan believes that to be successful in content marketing, no matter what industry you are in, you have to become the best and most helpful teacher of what you do both on and offline. To be a great teacher, you also have to be a great listener. Listening to his clients’ queries and solving them in a blog, video or other content was pivotal to his success, and can be in yours too. If you need help in planning, writing and sharing effective marketing content consistently, please get in touch with me today.